Your career takes up a huge chunk of your life, and over the years, you will mature in many aspects of it. However, some of us will reach different levels of maturity at different stages of our careers. Being a grown-up at work is all about attitude and decision-making rather than age and experience. 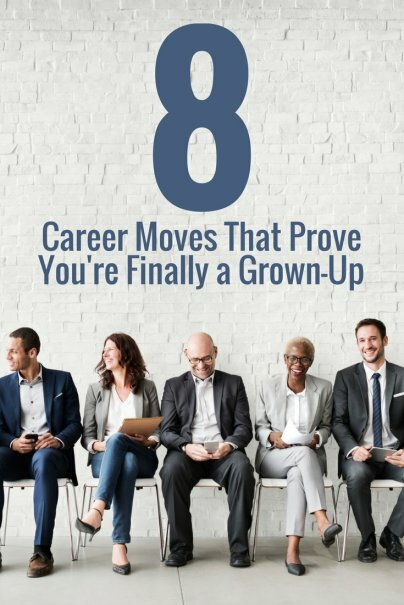 You don't have to wait until you're older to try any of these mature career moves. There are several ways to get a raise or promotion. The first is that you put in the hard work, the boss notices, and you get rewarded. The second is that you are offered a higher paying job somewhere else, and you ask the company to match it. The third is that you sit around hoping you'll get one, and maybe you'll get lucky. And the fourth is to just go and ask for one. A job is a task that someone is paid for. A career is an occupation with opportunities for advancement. Which one are you currently in? Some people might say working behind the counter at McDonald's is just a job, but that's not necessarily true. If that person wants to one day run their own franchise, that's a career. On the flip side, you could be sitting in an office wearing a suit and tie and going nowhere fast. Every workplace has them: It's the guy who points out every mistake you make, but never notices the good stuff. It's the woman who complains every time you raise your voice above a whisper. It's the boss who has office favorites, and you're not one of them. The people we work with are capable of making our work lives miserable. But once you realize that only you have the power to make yourself feel bad, it can be life-altering. It's not easy to admit to a mistake, especially in a corporate environment. Finger pointing is rife, and assigning blame to other people is commonplace. But as Bruce Lee so famously said, "Mistakes are always forgivable, if one has the courage to admit them." The key word here is courage. It takes real maturity to step up and say something like, "That's my fault, I should have been more prepared." Is it something that could get you in trouble? Possibly. But the other option is hiding from the truth or blaming others, and that's not very mature. Accolades may come in the form of trophies or awards, or they may be a pay raise or promotion. And while they are certainly nice to have, if they are your only source of motivation, you're missing out on the inner growth necessary to become a better employee. Work is most enjoyable when it's fulfilling, and if you're stuck in a cycle of chasing praise and rewards, it can start to feel very empty. Put those carrots to the side and focus instead on becoming your best self. Then, you'll have really stepped into the grown-up world. As much as it takes guts to admit a mistake, it also takes courage to admit you cannot do something that was asked of you. If you play pretend, or spend sleepless nights wondering how on earth you are going to get something done, you're not being very grown-up about the problem. A sign of real maturity is to look around and see who is actually ideal for this task. You have your own set of skills, other people have theirs. Find someone who can do this job well and ask for help. Or, ask to trade projects if it's feasible. It will be better for everyone. And remember, one day someone will come to you, nervous and unsure, asking for the same kind of help. Whether you're in an office or working on a factory floor, there are jobs that need doing. And these jobs are usually assigned to specific people. After you've spent a few years in your career, especially in corporate America, it's easy to have a "head down, do my own job, stay out of other people's problems" mentality.